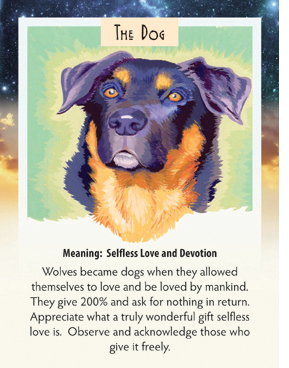 This week we have drawn The Dog card. This image is of our dog Smokey, with us 15 years now…devoted and loving, playful and intelligent. I am still amazed at the capacity of these animals for unquestioning devotion and love. Recently we rescued a small, 13 pound dog who had been badly treated. It took 7 months with us for her to feel playful enough to pick up a sock and toss it around. I nearly cried when she did as I never expected that from her. Despite what she had been through in her 6 years before we got her, she still had the desire to be playful deep down inside her tiny little body. My brother had to put down his dog this last week and we lost our dog Jack earlier this year. It is hard to explain the bond we have with these animals, but the best way I can describe it is just pure living love. Love from one being for another….and back. If you don’t have a pet, take a moment this week to befriend one that lives near you. Or better yet, volunteer to spend time with dogs in your local shelter. Animals have a key to unlock our hearts in such a special way. We can all use a little more love in our lives!